Engine line-up | What Car? There'll be a choice of three direct-injection petrol engines at launch, and a high-performance AMG addition will inevitably follow sooner rather than later. The launch engines 1.8s delivering 181bhp (SLK 200) and 201bhp (SLK 250) and a brand-new 302bhp 3.5-litre V6 for the SLK 350 all carry the Blue Efficiency suffix to denote that they are up to 25% more economical than their counterparts in the current model. An engine stop-start system is fitted to every version and an efficient seven-speed automatic gearbox is standard with the 250 and 350 and optional in the 200, so even the V6 manages almost 40mpg in the official consumption test, while the two four-cylinder models comfortably top 45mpg. 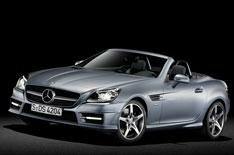 It's fair to say that the SLK has never been sportiest of roadsters. Things improved with the second-generation model of 2004, but the SLK's huge success has been founded on everyday usability and comfort rather than what it might offer on a cross-country blast. It's more of a scaled-down SL than a rival for BMW's Z4. Mercedes claims there's been a bit of a sea-change with the new car, though. There'll be three suspension set-ups Standard and Sports, both with conventional dampers but tuned differently, plus a Dynamic handling package with continuously adjustable electronically controlled damping. The Dynamic package also includes a couple of measures to make the car tuck into corners more acutely. Direct Steer quickens the responses of the steering, while torque vectoring reduces the chances of the car running wide in extreme cornering by gently braking the inside rear wheel.